If you download a file from the Internet, you take some risks that the file you downloaded is compromised or been altered or corrupted illegally by ill-intent cracker or hacker. To protect a file and ensure that the program is correct, perform only what is advertised and nothing more, stable, well-written, and is actually the original or the same file that been put up for download by the author, we can compare the cryptographic hash function of the downloaded file with the hash value or checksum that been posted or declared by the developer for the file, software or application (other verification method been the installer been signed with digital certificate, which used by large corporations only due to cost). Two most commonly used hashes are MD5 and SHA1. Other hash algorithm include HAVAL, MD2, MD4, MD5, SHA-1, SHA-2 (256, 224, 384, 512), RIPEMD (128, 256, 160, 320), PANAMA, TIGER (192/160/128), ADLER32, CRC32, WHIRLPOOL and VEST. Hash function adds additional security properties to the file so that any unauthorized modified and altered file will not have the same digital hash fingerprint. There are several free downloadable tools and utilities that can be used to retrieve or get the hash or checksum value value (also known as message digest or digital fingerprint) of a file or software installer by computing or calculating the cryptographic hash function algorithms. Some the the freeware and shareware hash calculators are listed below. HashCalc is a free, fast and easy-to-use calculator that allows to compute message digests, checksums and HMACs for files, including software, applications, binaries, installers, documents, archives and etc, as well as for text and hex strings. It offers a choice of 13 of the most popular hash and checksum algorithms for calculations, and is implemented using commercial software SlavaSoft QuickHash Library from the same author. Support of 12 well-known and documented hash and checksum algorithms: MD2, MD4, MD5, SHA-1, SHA-2( 256, 384, 512), RIPEMD-160, PANAMA, TIGER, ADLER32, CRC32. Support of a custom hash algorithm (MD4-based) used in eDonkey and eMule applications. Support of 2 modes of calculations: HASH/CHECKSUM and HMAC. Support of 3 input data formats: files, text strings and hex strings. Work with large size files. (Tested on file sizes up to 15 GB). Calculates hash/checksum and HMAC for files of any type: music, audio, sound, video, image, icon, text, compression, etc., with the extensions: .mp3, .wav, .avi, .mpg, .midi, .mov, .dvd, .ram, .zip, .rar, .ico, .gif, .pif, .pic, .tif, .tiff, .txt, .doc, .pdf, .wps, .dat, .dll, .hex, .bin, .iso, .cpp, .dss, .par, .pps, .cue, .ram, .md5, .sfv, etc. To use HashCalc, run and execute the program and the select the file you want HashCalc to calculate the hash checksum for you. Select the appropriate file type and the hash algorithm such as MD5 and SHA1 that you want by ticking the check box. HashTab is a Windows shell extension or Mac OS X Finder plugin which adds a tab called “File Hashes” to the Windows Explorer file properties. The tab contains the MD5, SHA1 and CRC-32 file hashes. These are common hashes that are used to verify the integrity and authenticity of files. 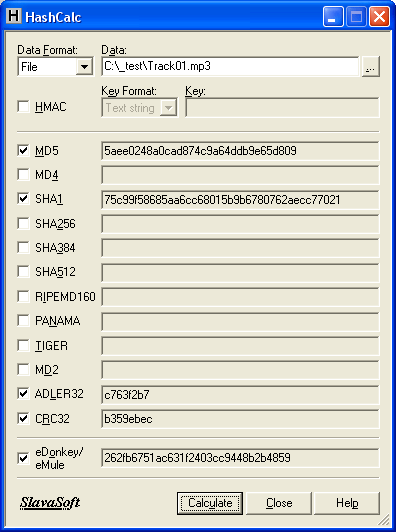 Many download sites list the MD5 hash along with the download link. The HashTab makes it very simple for Windows users to check these hashes on any file on the system without using external tools. To use HashTab in Windows, simply right click on the file you want to know the hash value or checksum of, then choose Properties. On the Properties window, select File Hashes tab, and you will see the hash on it. On Mac OS X, select More -> File Hashes and the HashTab window will appear. Download HashTab from implbits.com. It’s free for personal use on Windows. Windows PowerShell has the built-in capability to calculate and computer the hash values for files, eliminating the need to install third-party software. It’s command-line only but you can always write a script for ease of use. Check out the guide to use Windows PowerShell to computer hash values of files. WinHex is a universal hexadecimal editor (HEX editor) and disk editor, particularly helpful in the realm of computer forensics, data recovery, low-level data processing, and IT security. An advanced tool for everyday and emergency use which can be used to inspect and edit all kinds of files, recover deleted files or lost data from hard drives with corrupt file systems or from digital camera cards. Disk editor for hard disks, floppy disks, CD-ROM & DVD, ZIP, Smart Media, Compact Flash, and etc. Native support for FAT, NTFS, Ext2/3, ReiserFS, Reiser4, UFS, CDFS, UDF. RAM editor, providing access to physical RAM and other processes’ virtual memory. Data interpreter, knowing 20 data types. Editing data structures using templates (e.g. to repair partition table/boot sector). Particularly flexible search and replace functions. Disk cloning (under DOS with X-Ways Replica). Drive images & backups (optionally compressed or split into 650 MB archives). 256-bit AES encryption, checksums, CRC32, hashes (MD5, SHA-1, etc). Erase (wipe) confidential files securely, hard drive cleansing to protect your privacy. Import all clipboard formats, incl. ASCII hex values. Convert between binary, hex ASCII, Intel Hex, and Motorola S.
Character sets: ANSI ASCII, IBM ASCII, EBCDIC, (Unicode). Supports files >4 GB. Very fast. Easy to use. Extensive online help. To use WinHex to calculate the hash value for a file, run the WinHex program, then click on File -> Open (or simply press Ctrl+O keyboard shortcut). Select and open the file you want to know the checksum hash in the dialog box prompted. Then go to Tool menu and select Compute Hash (keyboard shortcut key is Ctrl+F2), and then choose SHA-1 (160 bit) or MD5 or any other hash function algorithm that you need. Get the has by hit OK.
WinHex is not a freeware nor available for free download. It costs anywhere from EUR 40.25 to EUR 156.90 for a license of WinHex. However, a evaluation or trial copy is available for download for you to try as long as you want. File Checksum Integrity Verifier (FCIV) is command-line utility that computes and generates MD5 or SHA-1 cryptographic hash values for files to compare the values against a known good value to verify that the files have not been changed. Can output hash values to the console or store the hash value and file name in an XML file. Supplies an exception list to specify files or directories to hash. Can store hash values for a file with or without the full path of the file. The FCIV utility is a simply tool. After downloading, it extracts the executable and files to your selected folder. You need to add the FCIV folder to your system path in order to able to call the FCIV function command from any directory. A more simple way is to install the FCIV to your \Windows\System32 folder. More commands, options and instruction to use plus syntax of FCIV (KB841290) is available. Able to generate the MD5 and SHA1 checksum for any file or string in your browser without uploading it, quickly and efficiently, and with no software installation required. Similar to OnlineMD5, this HTML5 file hash online calculator supports an unlimited number of files and unlimited file size. The files are not transferred to the server as all calculations are performed directly in the browser. If you don’t want to download and install any software, you can use Online Hash Value Calculator to calculate a hash (aka message digest) of data on FileFormat.info, implemented with tools from Sun (java.security.MessageDigest) and GNU Crypto. Online Has Value Calculator accepts entry of a string or target text, Hex bytes, or input of small file uploaded from local disk. It will calculate and return the hash values for Adler32, CRC32, Haval, MD2, MD4, MD5, RipeMD128, RipeMD160, SHA-1, SHA-256, SHA-384, SHA-512, Tiger and Whirlpool. Similar with Online Hash Value Calculator, but in a simpler and easier to use form format that automated computation of various hash functions for an uploaded file. Supports HAVAL, MD2, MD4, MD5, RIPEMD128, RIPEMD160, SHA, SHA-160, SHA-256, SHA-384, SHA-512, TIGER, and WHIRLPOOL. It allows you to download the binary or view the ASCII Hex. WinMD5Free is a tiny and fast utility to compute MD5 hash value for files. It works with Microsoft Windows 98, Me, 2000, XP, 2003, Windows Vista, Windows 7, Windows 8, Windows 8.1 and Windows 10. Supports almost all Windows platforms including Microsoft Windows 95, 98, 2000, Me, XP, 2003, Vista and Windows 7. Md5Checker is a free, faster, lightweight and easy-to-use tool to manage, calculate and verify MD5 checksum of multiple files/folders. Calculate and display MD5 checksum of multiple files at one time. Use MD5 checksum to fleetly verify whether files have been changed. Load, save, add, remove and update MD5 checksum conveniently. It is about 300 KB and does not require any installation (portable). Hash Generator is the free universal hash generator tool which automates the generation of 14 different type of hashes or checksums. It support most of the popular hashes including MD5 family, SHA family, BASE64, LM, NTLM, CRC32, ROT13, RIPEMD, ALDER32, HAVAL, WHIRLPOOL etc. for the file as well as text input. ‘Drag & Drop’ feature to quickly drag files onto the tool. Compute Hash calculates MD5, SHA1, SHA256, SHA384, SHA512 file hash. 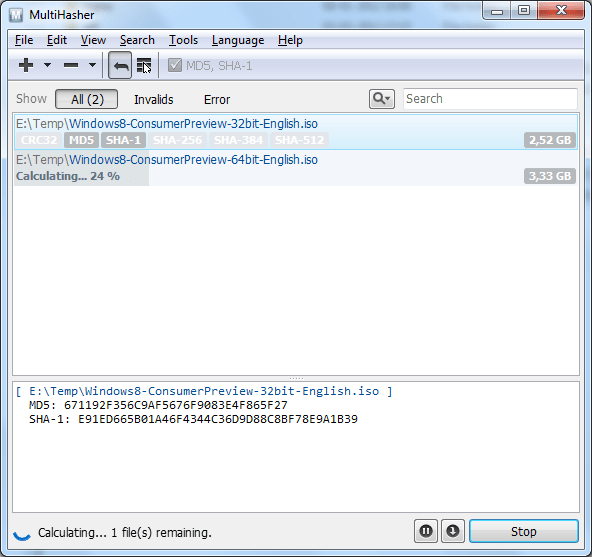 MultiHasher is a freeware file hash calculator. ExactFile is a multi-threaded Unicode file integrity verification tool that incorporates the functions of programs like fsum, md5sum, sha1sum, and sfv, but offers more. It supports very large files with no practicle file size limit and a one-step process for “stamping” a deployment folder with a checksum digest and GUI file scanner that can be burned to the CD along with the rest of your files, so that the disc can be verified if it has been damaged in future. 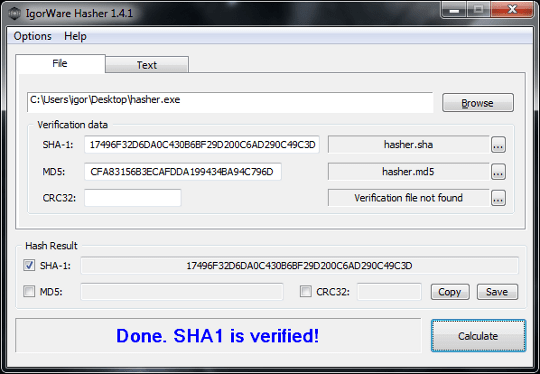 Hasher is a hashing utility for verifying integrity of files using a wide range of supported algorithms: CRC32, MD2, MD4, MD5, SHA1, SHA256, SHA512, RipeMD128, RipeMD160, ED2K. Processed files are logged and ready for export to a number of different verification file formats: SFV, MD5SUM, SHA1SUM. Multiple hash types can be generated simultaneously per file. Handy hash and file comparison functions, such as holding SHIFT to compare to next file or CTRL to compare two files, will make this task a breeze. HaoZip Archiver is a free compression utility from China which includes MD5 comparison function through HaoZipMd5.exe. 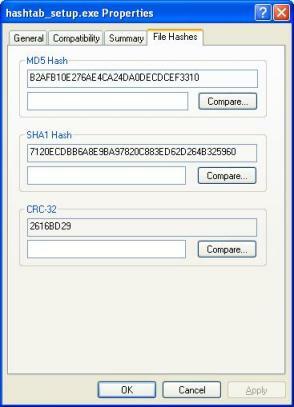 The checksum tool shows the file version, modified date, MD5, SHA1 and CRC32 hash values. To use the HaopZipMd5 function, run the utility through the HaoZip Start menu entry or via its context menu. Download HaoZip Archiver (note that Google warns that app is harmful program that trick you into installing adware or malware programs that harm your browsing experience).